Investing In What Works for America's Communities » How Can We Give Children the Best Chance to Succeed? Segregation and place-based inequality hurt our children’s future health and prosperity. A steady stream of studies continues to show that where a child grows up is one of the strongest predictors of her health and economic success (e.g., “Growing Up in a Bad Neighborhood Does More Harm Than We Thought,” New York Times, March 25, 2016; “Racial Segregation Is Making Americans Sick,” The Atlantic, March 16, 2016). 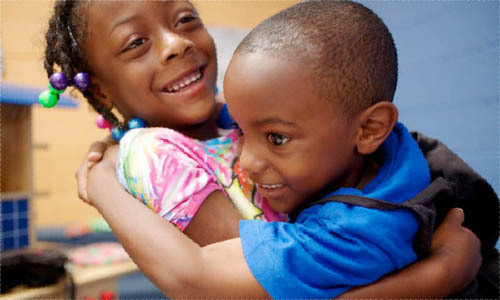 The topline message is clear: poor children living in poor neighborhoods have poor physical and financial health as adults—and children of color are at particularly high risk of exposure to harmful environments. But these same studies also point to solutions – that by working together to reduce poverty, segregation and neighborhood inequality, we can tackle some of our nation’s toughest problems. The Low Income Investment Fund (LIIF) has been part of the emerging dialogue between the health and community development fields seeking ways to do just that. In March, I was heartened by my dialogue with Jim Marks of the Robert Wood Johnson Foundation (RWJF) and Jack Shonkoff of Harvard University, moderated by Doug Jutte of the Build Healthy Places Network (BHPN), on how the health and community development sectors can come together to improve opportunity in a child’s earliest years. In February, I was thrilled to witness John Williams, President and CEO of the Federal Reserve Bank of San Francisco, and Risa Lavizzo-Mourey, President and CEO of RWJF, speak in their shape-shifter roles at the National Interagency Community Reinvestment conference to 1,200 others, primarily from the banking community, on why health and community development are necessary partners. Colby Dailey and Doug Jutte, Co-Directors of BHPN, wrote about this game-changing moment. Building on their thoughts, I believe that we are at a moment where together, the health and community development fields, can move from conversation to action. Reflecting on where we’ve been, we should now be convinced that the old debate about whether community development pursues people- or place-based strategies is over, and both sides have won. Williams and Lavizzo-Mourey demonstrated that in spades. We don’t need to change our work; we change how we do it, by intentionally designing projects and systems-level strategies that improve people’s lives. More specifically, we need to translate the lessons of the recent knowledge revolution into practice—and ensure that all children have a chance to live in a high-opportunity neighborhood that will give them the best chance to succeed in life. Impact Hidden in Plain Sight: A few years ago, LIIF provided a small renovation grant to the Booth Memorial Child Development Center in Oakland. We thought we were investing in child care. But, post-renovation, attendance jumped from 60% to 90%. Why? Because kids were having fewer asthma attacks caused by old carpets. Workers’ comp claims also dropped dramatically because teachers no longer had to lift children to wash their hands in too-tall sinks. We discovered we had made a health investment, hidden in plain sight. Fast-forward to the present, LIIF is looking for ways to intentionally create and measure the impact we saw at Booth Child Care. Mercy Housing and LIIF are developing a unique way to leverage health care funding streams to build supportive housing units for vulnerable populations with a contract and funding streams from the Los Angeles County Department of Health Services. The department is investing health care dollars in housing high‐cost, chronically homeless individuals to save significant downstream medical costs, as well as help address a major policy priority. Health care payers, like state Medicaid agencies, are similarly looking to invest in preventive, upstream health interventions. Valuing Social Investments: To fundamentally embed a people-perspective in community development, we also need a market that values this approach. To convince the market, we need to demonstrate that our investments produce better opportunities for people. Not a different outcome, but an outcome that has added value to society. That’s why we developed the Social Impact Calculator, a tool that monetizes the social value of investments like affordable housing, a great school or access to transit. It can also calculate an internal rate of social return to show the impact of an investor’s capital. LIIF has also launched Equity with a Twist, a new $6 million social capital product that seeks high social impact and modest financial returns for investors. Where are we headed? Our challenge now is to make sure the people-and-place objective sticks—and we need to focus on strategies that improve neighborhood environments for poor children. We need more, practical ways to measure social outcomes; we need more evidence and outcomes- driven work, where social value is measured and reported; we need to use this evidence to convince investors to focus on value in addition to cost. And we need to lift up successful projects where investors do value social outcomes. At LIIF, we are up for the challenge. We think it is worth it. After all, at the heart of it, community development is about improving opportunities for better lives for people living in places where those opportunities are few.